Riverwalk Quilt Guild member Monique Peeters' quilts are nothing less than stunning, especially considering their background story. Born to an American soldier and his French war bride, Monique came to America at the age of two, when her family settled in Chicago. After marrying a Belgian, they lived in the Netherlands for a time before coming to America to live, settling in northern Illinois. Combine that with her many years of teaching math at the junior high school level and an observer begins to sense a unique story unfolding. Her first sewing machine, used while she lived in the Netherlands, was powered by hand cranking. 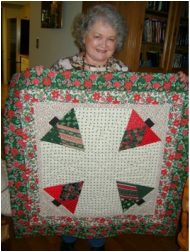 She designed a small Christmas tree quilt, her first project, piecing and quilting it with the hand crank. In fact, she owned three hand cranks and two treadles before she acquired her first electric machine. Then she was off and running. At her husband’s urging, she eventually went straight for a long-arm to create the many designs floating in her head. The two of them even took long-arm maintenance classes together to increase their productivity. ​Monique loves free-form quilting most of all. 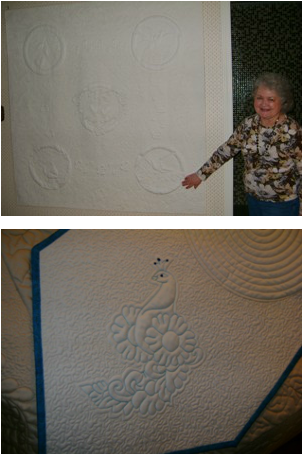 She and her engineer husband designed a whole cloth quilt that tells a pictorial story of two doves who meet, commit to one another, and then live happily ever after. It is closely and beautifully free-form stitched in her favorite "quilt it to death" fashion and is the piece of which she is most proud. It was she who provided Stars In My Garden, the guild’s 2015 opportunity quilt, with its beautiful final touch - lush quilting.In 2007 she entered one of her works into the quilt show at Naper Settlement, where she met RQG member, Valli Schiller, and heard about the guild and its many programs. She quickly joined and has since served as hospitality co-chair for two years.